In his book, The Seven Habits of Highly Effective People, Stephen Covey describes a practical set of habits that can help you grow personally to become more effective. His seven habits represent a principle centered, character based, inside out approach to personal and interpersonal effectiveness. These Seven Habits help you develop personally and become more effective in how you work and relate with other people. Developing these habits can help you tackle your work and life challenges with confidence. At the core of these habits are a deeper understanding of yourself and an appreciation of the fact that you need others in order to achieve your goals. Good habits can be defined as the intersection of knowledge, skill, and desire. Changing or creating habits can be hard, but can be done if you are committed to change. You have to consciously work at them for a while before they become part of who you are and how you interact with other people. 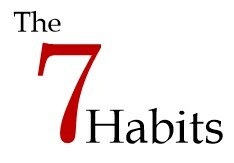 It takes time and effort to develop the Seven Habits. But it is worthwhile and will have a lasting effect on your personal effectiveness and on your life. Being proactive means controlling your environment, rather than having it control you. You create this habit by taking initiative. Think about what needs to be done and do it. When faced with a problem or a difficult situation, take the initiative to find solutions rather than just recognizing the problem and waiting for others to solve it. This habit is about visualizing where you want to end up. It is about looking ahead and seeing where you want to ultimately get to. So before you start something new, take the time to think about your ultimate goal, then plan how you will reach that goal. To practice this habit, begin each day, activity, or endeavor with a clear vision of your desired destination. This habit is about organizing and prioritizing your activities. The first step in developing this habit is to find out what is important to you. You have to determine what you truly value and put those first on your list of things to do. Often times people put the things they are believe are urgent at the top of their “to do” list. Unfortunately, they often find they do not have time to complete the things they believe are important because they have spent too much time on the urgent less important items. So, to develop this habit, find out what is important to you prioritize your activities so the important ones are on the top of the list. The win-win philosophy sees life as a cooperative arena, not a competitive one. To incorporate this habit into your life, you need to create a frame of mind that has you seeking mutual benefit in your interactions with others. In your interactions with others, focus on getting agreements or solutions that are mutually beneficial to all parties. Don’t feel you have to get a better deal than other people. Have the mindset that there is enough for everyone. Most people do not actively listen while they are conversing with another person, rather they wait to talk. When working with others do not be so anxious to get across your point of view that you do not listen to the other party. Really listen to the other party to try to understand his or her point of view. Try to get a good understanding of what the other person believes and how they feel about the topic. Then try to explain your perspective. This is the habit is about creative cooperation. Creative cooperation is based on the belief that people working together can produce far better results than they could individually. Synergy helps you discover things together you are much less likely to discover by yourself. The key to achieving this habit is to value differences among people and try to build creative solutions through interactions. When you interact with others, be open to their opinions so you can gain new insight. These interactions help leverage individual differences to find a creative way to solve a problem. Focus on collaborating with others to get the best results. Physical – building your sense of well-being through exercise, nutrition, and stress management. Mental – educating yourself on new things to hone and expand the mind through reading, visualizing, planning, and writing. Social/Emotional – building your own sense of well-being through service, empathy, synergy, and security. Spiritual – building a sense of self through meditation, inner reflection, spiritual reading, and study.